Mr. Clifton Robinson was born in 1938 as a third-generation Wacoan. Through his mother's side of the family Mr. Robinson traces his ancestry in America back to Warner Washington, the brother of American president George Washington. Mr. Robinson's great-grandfather opened a general store in Waco shortly after the Civil War which operated until his grandfather closed it at the beginning of World War I. Mr. Robinson's mother held a Masters degree in French and taught at Baylor University while his father worked at Atlas Cement Plant during the Great Depression era, then began work in the insurance industry in 1949. Mr. Robinson attended City of Waco public schools Sanger Avenue and Waco High, graduating in 1955. The family tradition dictated that Mr. Robinson attend Baylor University afterward, where he joined the ROTC and the Try-Cs, which was the forerunner of the Phi Delta Theta fraternity. Then in 1959 having completed his overall curriculum but 30 grade points shy of graduating, Mr. Robinson joined the Texas National Guard, where he served for nearly six years. During this time he continued to work on his college degree, completing one night course per semester until he received his BBA in 1963. It was during this time also that Mr. Robinson began working in the insurance field, first learning the ropes in the family business his uncle founded and father later joined, then creating his own company, Robinson-Lanham Insurance in 1961. Shortly after he received his degree, he transitioned into creating another venture that would eventually become the focus of his professional career - the founding of the National Lloyds Insurance Company in 1964. Mr. Robinson worked closely with Citizen's National Bank throughout his career in the insurance industry. In 1971 he began guiding the bank's life insurance program as a consultant. The success of this venture and Mr. Robinson's solid credit history led to his purchase of American Bankers Insurance Company via a Waco-record ten million dollar loan from Citizen's in 1979. Business continued to thrive through the end of the twentieth century. Then in 2000 Mr. Robinson sold National Lloyds to a group from Iowa called GuideOne for seventy million dollars, but subsequently bought it back from them one year later for thirty million dollars. At that time he consolidated his various insurance holdings into one company named NLASCO, which eventually was sold as a package to Colorado-based Affordable Residential Communities, now known as Hilltop Holdings, for 150 million dollars in 2007. Mr. Robinson still works as a director for Hilltop Holdings. In 2009, Robinson Media Co., LLC, with Mr. Robinson serving as chairman and CEO and his son Gordon serving as president, purchased the Waco Tribune-Herald, Waco's local newspaper, from Atlanta-based Cox Enterprises. With the purchase, the 117-year-old newspaper came under local ownership for the first time since 1976. Mr. Robinson has been married to his lovely wife Betsy for over thirty years. The Robinsons attend Central Christian Church and have two sons, Charles and Gordon, and five grandchildren. Grandsons Cole and Chad Robinson now represent the fifth generation of Robinsons at Baylor University. The Robinsons have been stalwart allies of education, Waco and Baylor pride through their many charitable acts and organizations. In 1995, they joined Mary Ruth and Malcolm Duncan in creating the MAC Grant program at McLennan Community College. Administered via the Waco Foundation, MAC grants provide financial assistance to nearly one quarter of the 2,200 students who graduate from McLennan County Schools each year. Clifton then donated three million dollars to purchase what is now known as the Clifton Robinson Tower for Baylor University. In 1997 Betsy co-founded Fuzzy Friends Rescue, a non-profit, no-kill animal shelter she devotes most of her time to today. 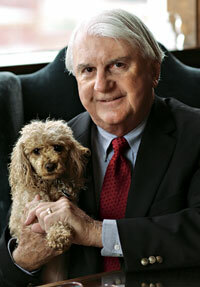 In 2003, Clifton donated one million dollars to help create Friends of Baylor in support of the Baylor 2012 vision and the continuation of the Christian vision of Baylor's future. The C. Clifton Robinson and Betsy Sharp Robinson Endowed Scholarship was founded in 2007 with an endowment of five million dollars as a need-based scholarship for Baylor Honors Program students. More recently the Robinsons have spearheaded two major projects. The first is "Branding the Brazos," a Waco Chisholm Trail Heritage sculpture project at Indian Spring Park that has commissioned Western sculptor Robert Summers to create a series of 30 sculptures depicting a trail drive along the Brazos. The Robinsons donated a one million dollar challenge grant to fund the initial sculptures and provide support of the completion of the 25 cattle. The second major new project involves Clifton Robinson and H. Bland Cromwell co-donatating the former General Tire Plant to Baylor University for renovation and construction of the Baylor Research and Innovation Collaborative (BRIC). This research facility will provide graduate research space for Baylor's School of Engineering and Computer Science and for select Baylor interdisciplinary research centers and institutes. It also will provide space for advanced technology training and workforce development for Texas State Technical College and McLennan Community College programs; space for anchor industry partners already located in or newly recruited to McLennan County; and space for joint research symposia and educational meetings. Robinson Well, I’m not going to say that my family was all that charitable because they weren’t because they didn’t have the resources to be charitable. And I, you know, I would love to say, “Oh, yeah, they were the great philanthropists,” but they were not because they had no resources. We barely got by. My mother’s little rent houses paid my Baylor University education. But I was taught every Bible verse that’s ever been written about charity—how it’s better to give than to receive. I guess I heard those things my entire life ringing in my ears—ringing in my ears—constantly. And then as I began to establish my own thoughts and thought patterns and strong desire to be successful, I watched what other people did. Now how do the smartest people that I know—how do they operate? What do they do? And who do I respect the most? And when I read about people, what has been one of the overriding characteristics? Well, almost universally, you come up to—back to charity. And charity begets charity. I used to give the first twenty years of my charity, which was certainly nothing to the extent that it’s been. I did everything anonymous because I didn’t want anybody calling me for money. Because when your name’s on a building, everybody calls you. Well, then I began to realize that my great mentor—and that’s Paul Meyer, and that’s a man named Charlie Seay, who I went to his funeral in Dallas about two weeks ago, and Bernard Rapoport. Those friends of mine—three great friends of mine, they openly gave and their names were put out there and their names were in the newspapers. Then I began to realize that—because I’m watching what they’re doing and I care—I told all three of those people, “When I grow up, I want to be like you.” Well, when I tell somebody, like, that I want to be like y’all—well, as much as I can. Bernard and I happen to differ quite substantially on political views, but otherwise, we are dear friends. Charity begets charity. So, if somebody’s watching me, and they’re following me—and I will give you a good example of that in a minute—I’m doing a disservice if I don’t allow my name to be used. I’m not doing the right thing that I’m trying to accomplish, and that is spread the word that charity is the way. And it is.